The opening ceremony was very festive, including a number of entertaining and informative slide-show presentations with music from around the world, celebrating each team. This year featured a team from Switzerland and France! Also, for the first time, there was a representative from Cuba. We also had the privilege of hearing a short speech from a member of the Real Academia Española in Costa Rica and the Minister of Education of Costa Rica. The first day of the tournament was Copa de Naciones (National Cup), wherein a team of three from each nation faces three from another national team. The team that wins the most gets a point. The team with the most points at the end wins. As is usually the case at tournaments, I started out drawing extremely poorly, but regained my bearings after a couple of games. Among my opponents were former world champions Rocco Laguzzi and Airán González. I won against Airán (not knowing until after the game that he was a former world champion), inspiring a round of applause from the other participants. The next day, the actual world championship began. For three and half days and 21 rounds, I got to meet a lot of people, receive a lot of regalitos (little gifts interchanged among the players during almost every round, a wonderful cultural feature of the Spanish-language tournament experience), learn a lot of cool new words and put down a few down myself, and experience some great sportsmanship along with a very few not-so-pleasant experiences. One of my favorite moments was getting to play Serge Emig, a world champion of French duplicate Scrabble (who won this year's duplicate championship in Spanish, too!). We represented the nexus of three Scrabble worlds (French,Spanish, English). He won. Two of the 10 games I won finished in relatively dramatic fashion. In one game, with a rack of ADEINSU and a G dangling in the triple word score line, I played out with the triple-triple (which they call palabra nonuplicada or por nueve) INDAGUES (from INDAGAR, cognate of INDAGATE in English; it was the only playable word from the group of eight letters, which include AGNUSDEI, GENIUDAS, GUINDASE and GUINDEAS). In the last game, my opponent played PINTASE to bingo with only a couple of tiles left in the bag. Through the P, I placed ENCRESPO (again the only playable bingo of 5), scoring 149 and securing the victory. I'm still awaiting the publication of the specific individual statistics, so I will share the link when they are posted. In the meantime, I will say that the average scores are significantly higher than in English-language Scrabble - usually around 500 points per game for the best players in the world. There are usually about five bingos (total) played per game. The flow of the game is different, too. For instance, NO notes can be prepared before the game. (Since I track tiles, I had to write out my distributions after the game began.) After you begin to put down a word, you cannot change the play. The score is called, the new tiles are drawn and put on the rack, the score of the play is written, and THEN the time is started. If there is a challenge (which is free), it must be done after the word is put down and before the new tiles are drawn. Also, the entire score sheet is turned in at the end of the game. It includes the number of Scrabbles (their word for bingos) played. They keep meticulous records of it. The pairing system they use is Swiss and the rating system is a complex ELO, the details of which I'm still trying to grasp. To announce that the pairings were ready to begin play for the next round, they played music loudly on the sound system, which this time featured the theme to INDIANA JONES. On the other hand, the recounting and complaining between rounds is very much the same. For the first time, there were Protiles available for the tournament. They play on simple fold boards, set at 90 degree angles. (Most of the players except for one were quite surprised and pleased that I play upside down so that they could play with the board facing them). I really hope that in the next few years - if not next year - we can actually get rotating boards like the English-language players have had for decades. On a personal note, it still amazes me how little English-language players know of the second largest world championship in the world, how few word-study programs have been adapted for Spanish study, and that no board makers make Spanish-language boards and only very recently ONE tile maker has one color of tiles available in Spanish. 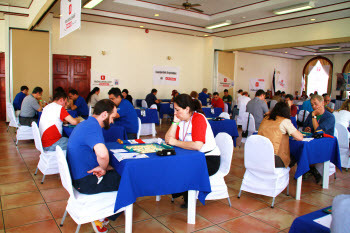 Besides the great joy of participating in these tournaments, my hope is to raise awareness among the other players so that a true sense of brotherhood develops among FISE and WESPA (or any other English-language Scrabble organization). These players are just as good as their English-language counterparts and put just as much effort into their game. They deserve just as much recognition. Congratulations to Luis Picciochi, the new world champion. Here are the final standings. Next year's FISE World Championship will take place in Mexico.Ojalá, I will be there, too!